Delighted to once again partner with our friends at Netgear to bring you another great competition. Netgear are renowned for designing a extensive range of award-winning products ideal for everybody home and business needs. Their Arlo range of security camera kits can help to protect your family and properties and we have two up for grabs. All we ask is for you to Like our Facebook page and post the hashtag #Netgear and or follow us on Twitter and Retweet and follow. So two attempts at winning with us and Netgear !! Let’s take a peak at some of the great reasons us Arlo. Firstly not only do Arlo security cameras deter any possible unwanted intrusion but the system captures images straight to our smart devices. So if the camera detects movement within the area, an alert can be sent direct to you allowing an easy login, whereupon live coverage appears, allowing us to make a judgement that our property may in fact be secure and has been tripped by a pet or family member. More God news? 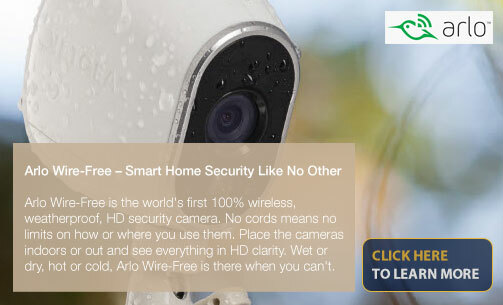 The Arlo cameras are weatherproof making them suitable for both internal and external use. • Monitor visits. From housekeepers and babysitters to repairmen and yard help, keep tabs on all the activity. • See who’s at the door. Whether you’re on the couch or at the office, Arlo can alert you when someone’s coming. And show you who it is. • Never leave home alone. Arlo motion alerts let you know whenever anything moves and 7 days of free cloud recordings allow you to review whatever happened. Arlo is 100% wire-free, meaning no cords or visible mess from cables, outlets making sure that there are no limits to where Arlo can be used. And thanks to its superior night vision it works perfect at night! Here at Comms Express we have a variety of systems available to suit the users requirements, dependant on how many cameras are required or what features you may be need. 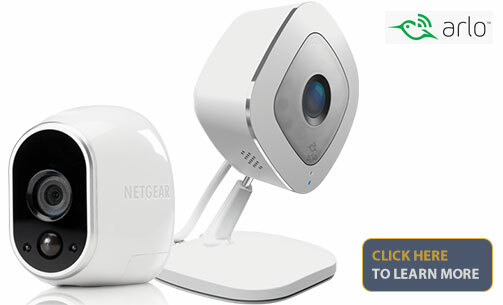 So plenty of reasons to get social and connect with us via Facebook ha Twitter and you could be the proud of a new Netgear Arlo Security Camera Kit! Full T&C’s can be found here. Good luck! If you need any further information please do not hesitate to contact us.